Cal here. It is Tuesday, so it is time to S-T-R-E-T-C-H and see what is happening in the world of stretch glass. One of the great things about stretch glass is that we have so many different items and most of them are available in a range of colors. 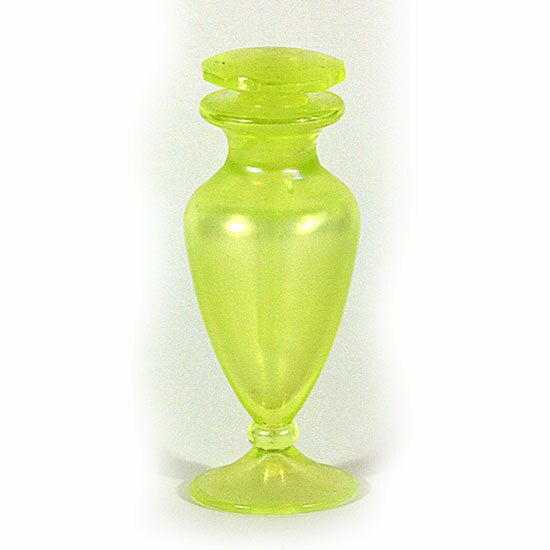 Collecting all items within a category of similar items in all colors can be a daunting task. And once someone gets “everything” in the category someone else will be sure to discover something that was previously unknown, or maybe it is better to say, “not recently known” because, of course, the item was known by someone when it was made. Bath items is one of these fascinating categories of stretch glass. We know colognes, powder puffs, etc. 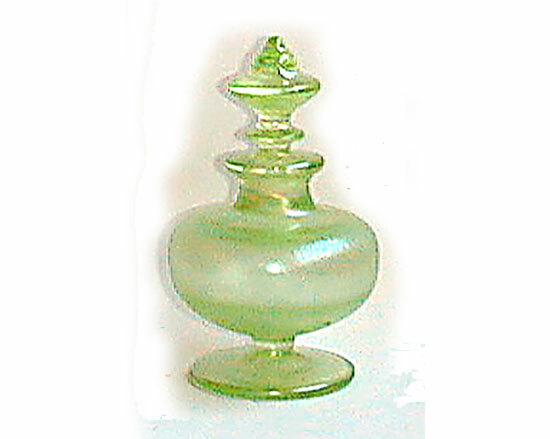 were produced mostly by Fenton and in Celeste Blue, Florentine Green, Grecian Gold, Persian Pearl, Tangerine, Topaz, Velva Rose and Wistaria (Fenton’s spelling). 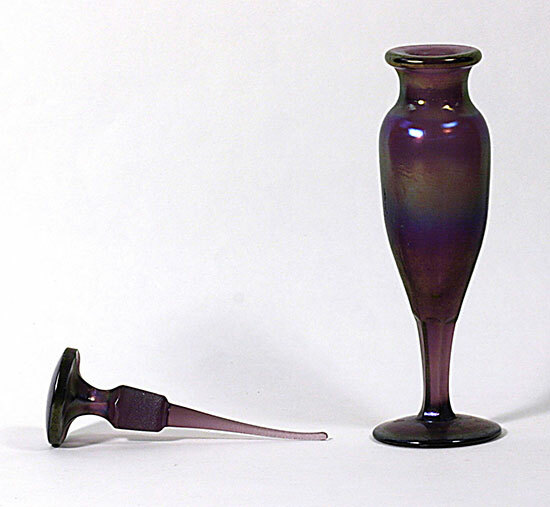 Maybe one of our readers has one of these items in another color; if so, we would certainly like to know about it. 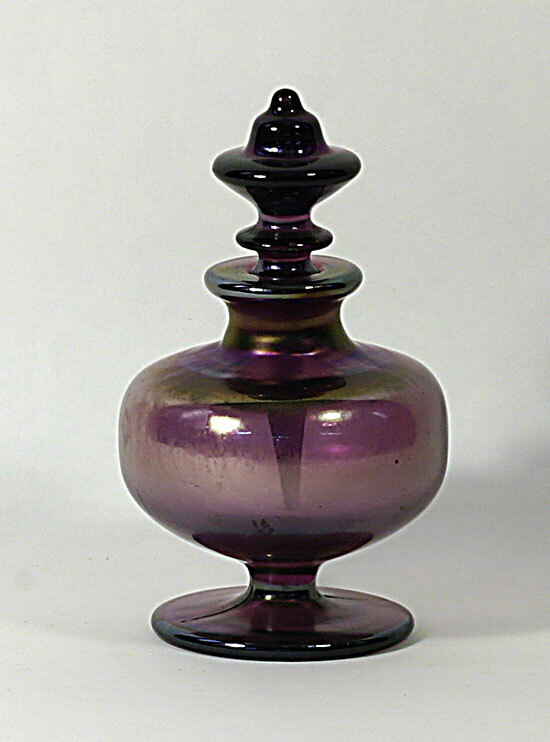 Acquiring all of the bath items in all of the colors is going to take some time and, based on what we know today, is actually not entirely possible because many of these items are not known to exist in certain colors – again, if you have something unusual in this category, please share a pic of it. 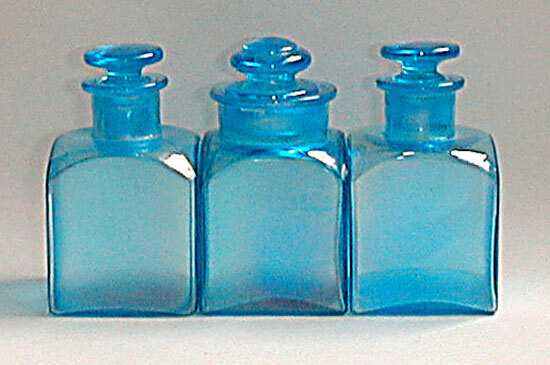 This category includes bottles (square with narrow or wide openings & glass stoppers), colognes (round and in varying heights with glass stoppers which included daubers of a length to match the depth of the cologne), powder jars (varying sizes and shapes), bath salts jars and trays for these items. 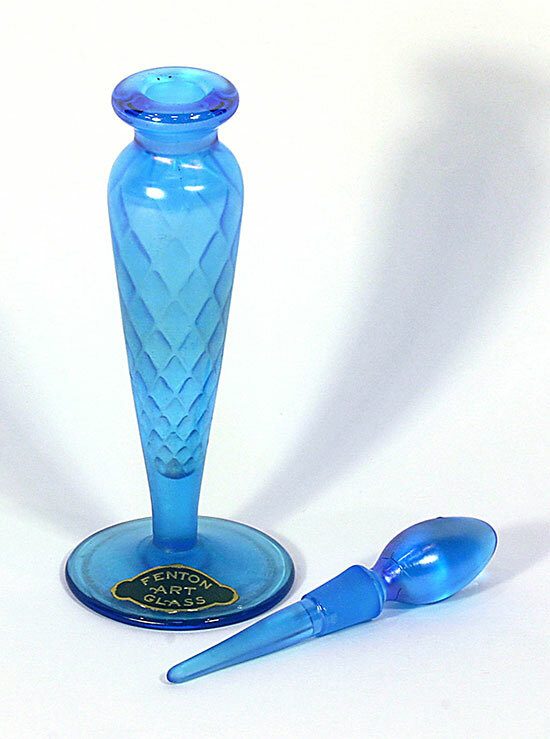 One might also include fan or other small vases, tumble-ups, guest sets and even smoking items, if they were trying to assemble all the items which might have been in the bath or on the vanity in the 1920’s. 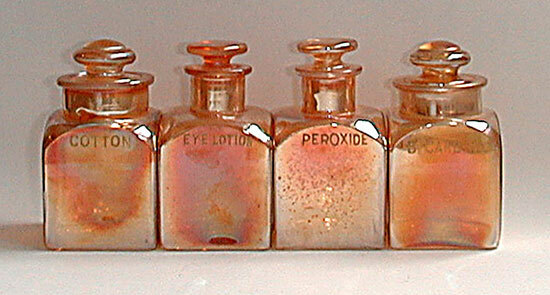 Tonight we will focus on the bottles, colognes, powder jars and trays. Let’s take a look at the bottles. They are square, taller than wide and have one of two sizes of stoppers. 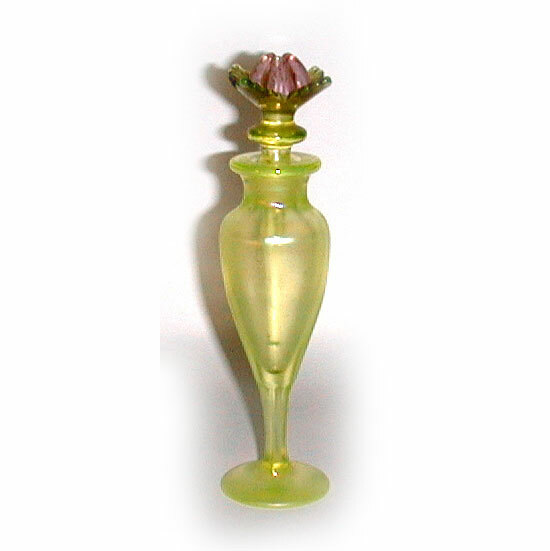 I am aware of them in Celeste Blue, Florentine Green, Grecian Gold and Velva Rose. 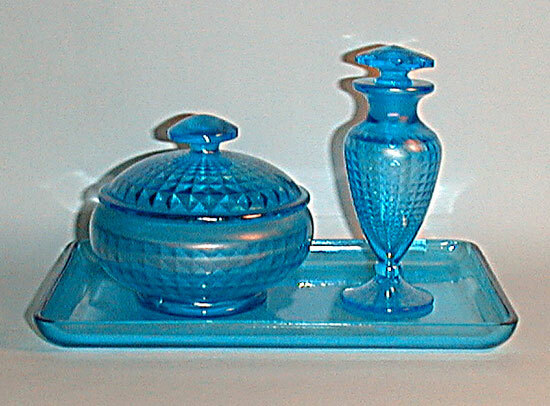 Fenton made these in a wide array of non-stretch colors and made a tray which holds 3 of the bottles. 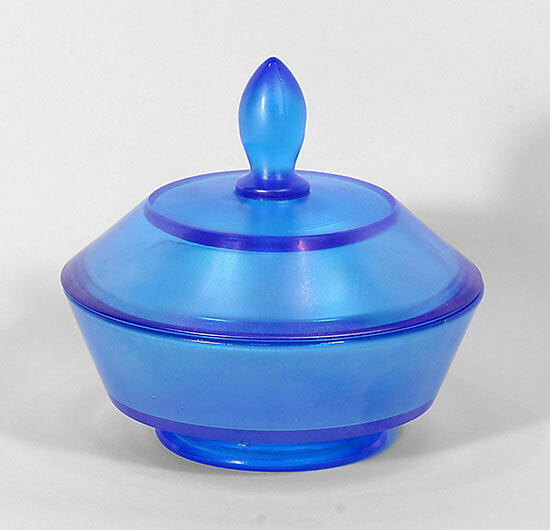 I’m not aware of one of these trays in stretch glass, but it is possible that one exists. Sometimes these bottles are decorated or have names on them such as “Mouth wash,” “Cotton Balls,” etc. 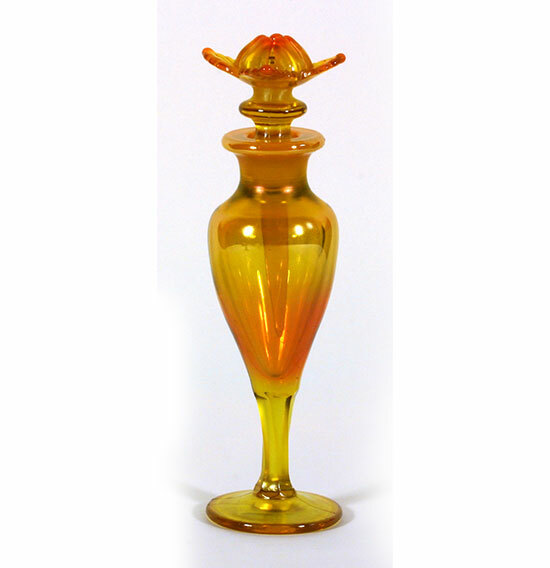 Colognes were made in a wide selection of sizes and styles. A picture is worth a thousand words, so I’ll show you an assortment of colognes rather than try to describe them. 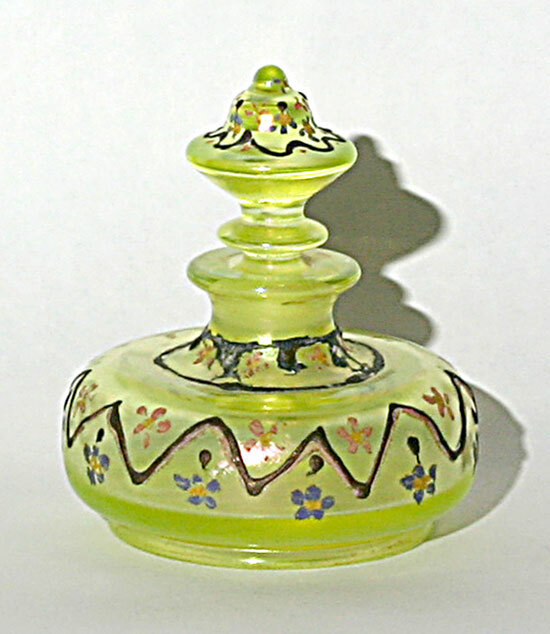 These also were sometimes decorated (not often, btw) and the decoration, especially the painted flower stopper, is highly desired. 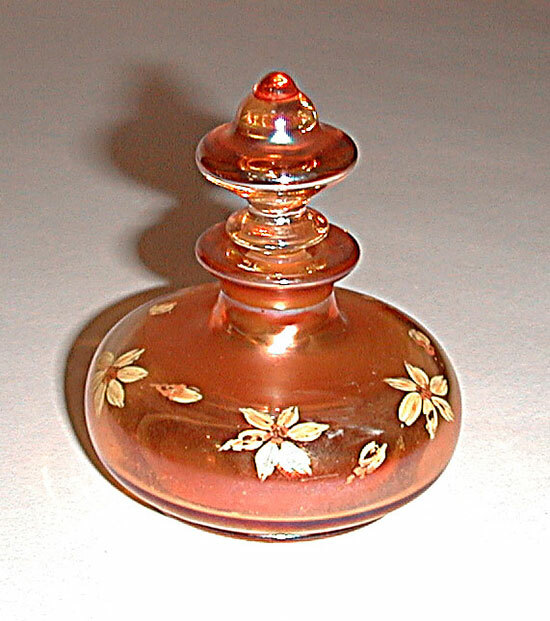 Usually 2 matching colognes and a powder jar are shown together in photos or advertisements from the period and many of us attempt to collect sets in this manner. From personal experience, I’ll say that it may be many years before cologne #2 is found to match cologne #1 and getting the powder jar may take a few more years! 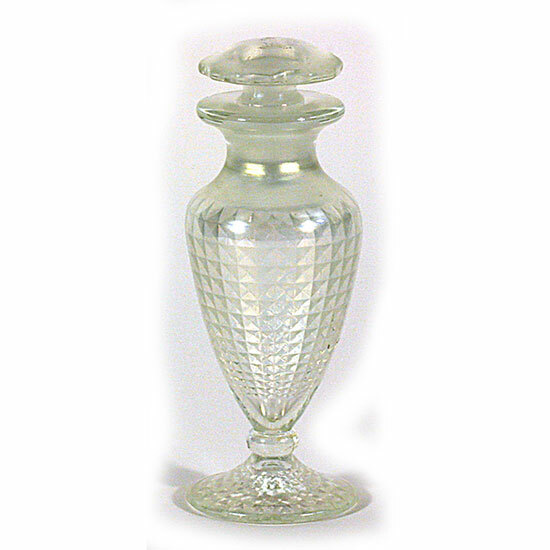 Next time we will talk about and look at powder jars, bath salts jars and trays. 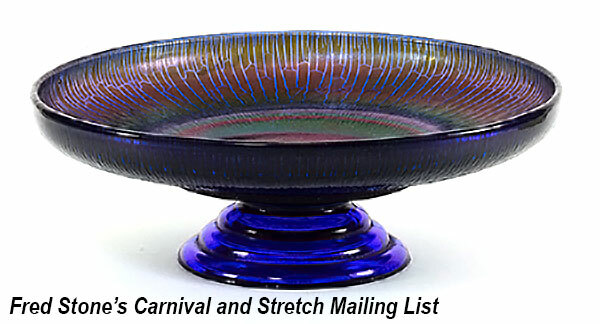 If you are joining us at the Tampa Bay Carnival Glass Convention later this week, I’ll have an assortment of these items in my banquet talk display so you will be able to see them (and a lot of other stretch glass) in person. I hope to see you there and/or to hear from you here and see which of these items you have.